There is a good reason why Chocolate Chocolate Chip Shortbread Cookies have two “chocolates” in their name. 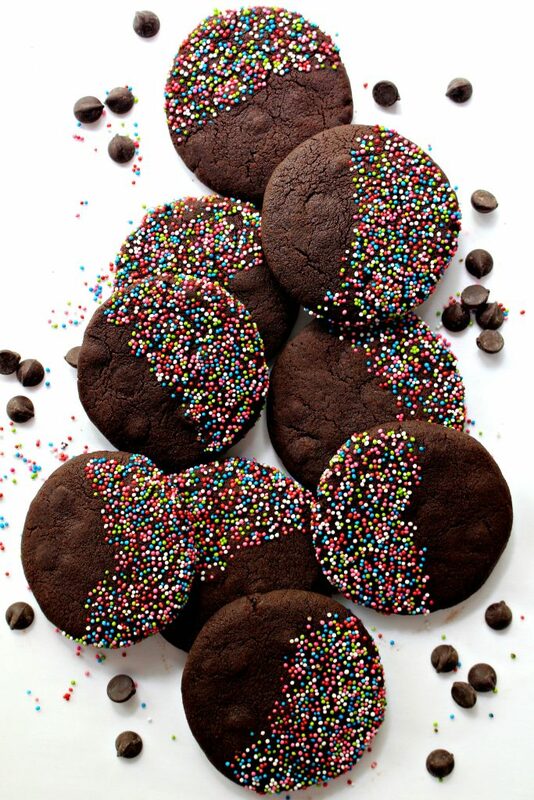 These crunchy, melt-in-your-mouth cookies are incredibly, deeply, doubly chocolate! I haven’t been a teacher for decades, and neither of my grown children are currently pursuing further degrees, but I still mark the seasons, not by the calendar, but by when the school year begins and ends. August is here. The weatherman continues to issue the same forecast he has been repeating for weeks. Our temperatures will remain in the high 80’s and into the 90’s for the foreseeable future. All indications are that summer will be hanging around for a while. Don’t be fooled. The Target and Office Depot sale ads have been announcing seasonal change for several weeks. My daughter, a teacher, goes back to work this week. Her students return in two weeks. College kids are packing up and getting ready to head to campus. Fall is here, in my opinion. Back-to-college means care package time! Boxes of goodies sprinkled with love are a fortifying taste of home. In a month or two, the weather will be cooler on many college campuses. Until then, melting and spoiling are still concerns when choosing chocolate care package recipes. 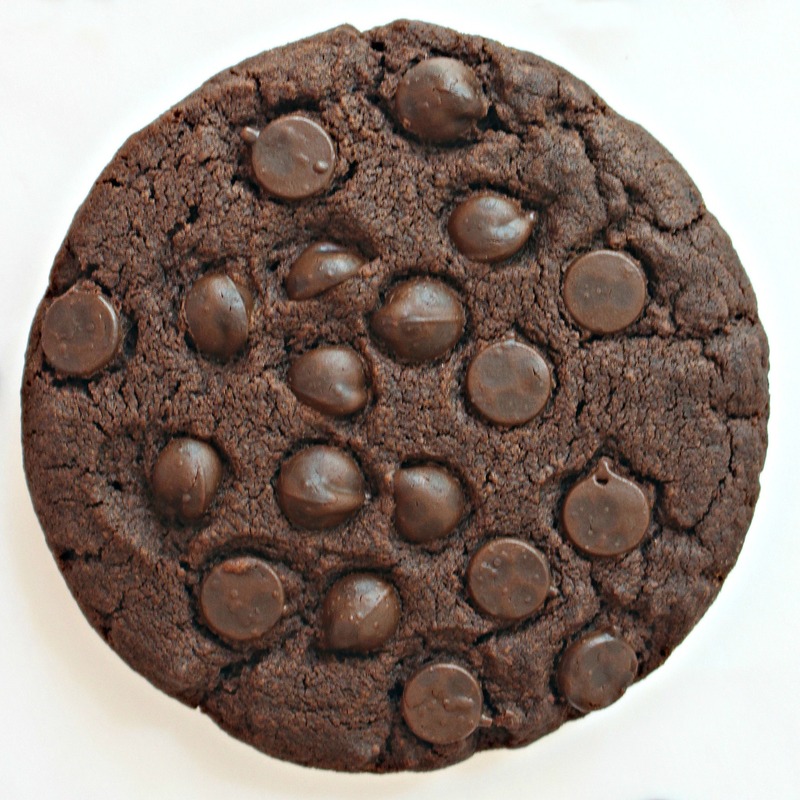 Chocolate Chocolate Chip Shortbread Cookies festooned with chips are luscious cool weather cookies, and with one simple change, can be successful care package treats all year. In warm weather, defy the heat by tucking the chips inside! 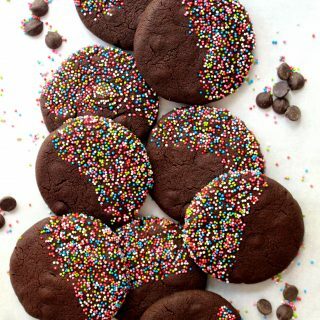 With the chocolate chips safely hidden inside the cookies, there is no gooey chocolate to melt while shipping or on fingers while eating. The chips melt a bit into the dough while baking, giving a boost to the chocolate richness of the cookies. But with no alluring chips on top of the shortbread, the cookies lacked eye appeal. Sprinkles to the rescue. I often use sprinkles to liven up a cookie’s appearance. 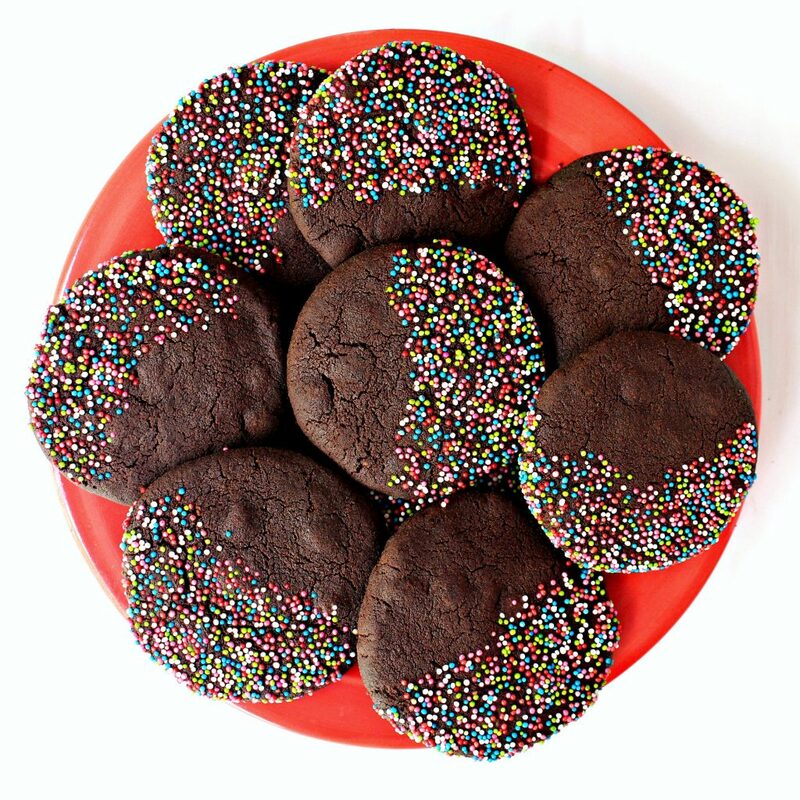 I think the multi-colored nonpareils turn Chocolate Chocolate Chip Shortbread Cookies into a party! 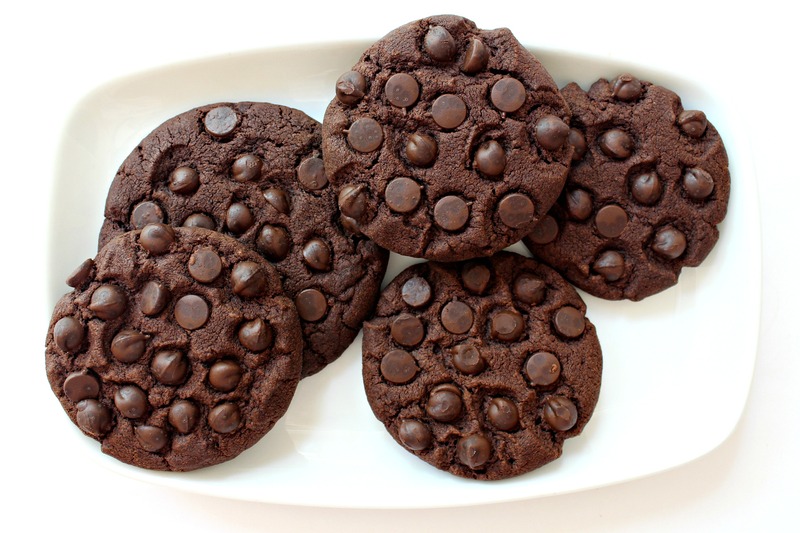 Chocolate Chocolate Chip Shortbread Cookies would also be a special treat for back-to-school lunch boxes or after school snacks. I hope your back-to-school season is off to a great start. With Chocolate Chocolate Chip Shortbread the school year will be even sweeter! In a large mixing bowl, whisk together flour and cocoa. In the bowl of an electric mixer, cream together butter and confectioners’ sugar for about 3 minutes ,until light and fluffy. Gradually add flour mixture until blended and the dough forms. Pour the nonpareil sprinkles into a shallow bowl. Using a medium (2 tablespoon) scoop, scoop a portion of dough and flatten slightly in your palm. Add about 15 chocolate chips on top of the dough, then knead with dough minimally with your fingers to distribute the chips. Roll into a ball, then flatten into a ½” thick disc. 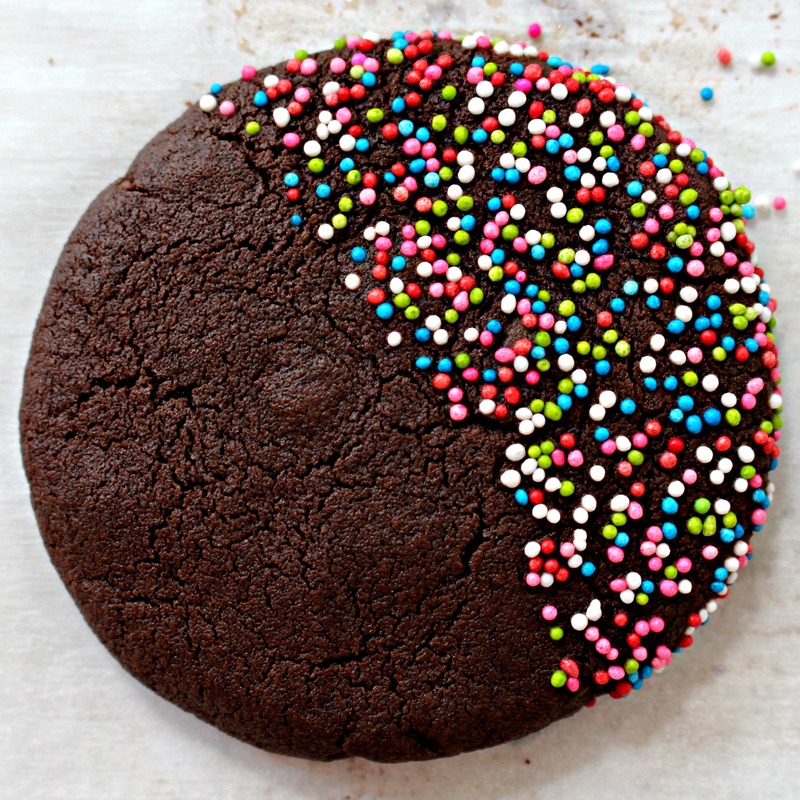 Dip the edge and top of ½ of the dough disc into the sprinkles to coat. Place the cookies 2” apart on the prepared baking sheet . Bake for 12-14 minutes, or until the top of the cookies are dry to the touch. Remove from the oven and allow the cookies to cool on the baking sheet for 3 minutes before placing on a wire rack to cool completely. Pour the chocolate chips into a shallow bowl. Using a medium scoop, Scoop a portion of dough. Roll the dough into a ball and dip the top half of the ball into the chocolate chips, pressing to attach the chips to the dough. Place the cookies 2” apart on the prepared baking sheet. With the palm of your hand, gently flatten each dough ball to ½” thickness. Double wrap pairs of cookies (with bottoms together) in plastic wrap, then place in a column in an airtight container or freezer weight zip lock bag. For longer storage, vacuum sealing is recommended. Such fun and pretty cookies Wendy. You can always capture my heart with shortbread – and add chocolate? Smitten! I’m sure I’m drooling, Wendy. 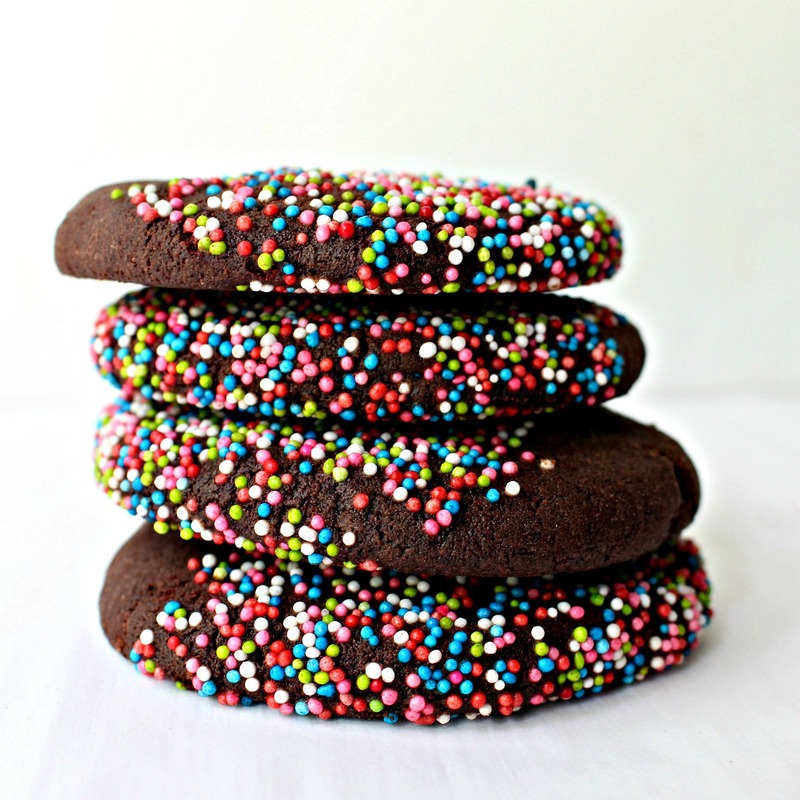 You know I love these given the extra chocolate…plus, I do favor nonpareil sprinkles. I am just thinking how special it would be to receive a care package with these wonderful cookies from home. 🙂 My little one would gladly enjoy 6-12 of these as an after school snack! ; ) We don’t go back to school until after Labor Day but it goes so fast. Bring on the chocolate – these are perfect for me! Love shortbread and the easier the better. I love minimal ingredient recipes and am always amazed at the fantastic flavor you get from a simple mixture. Very pretty too! I am so glad you feel well enough to be blog browsing, Reeni!! I hope the fall brings you health and healing along with chocolate and pumpkin!! I still get that nervous feeling every September even though neither I or my kids are still in school. 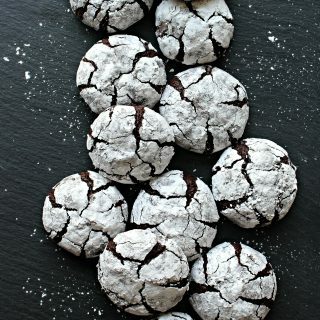 I think that perhaps these chocolate cookies may help alleviate the butterflies in my stomach! Chocolate and short bread what a wonderful combination! Thanks for sharing! Thank you for sharing you boxed cookies on Oh My Heartsie’s Friday Features Linkup. Your Cookies look amazing and they are really pretty! Thanks so much for sharing with us at Full Plate Thursday and have a fantastic week!